Back on Dec. 17, shortly after three in the morning on State Road 7 in Dade County, Fla., Daniel Straus was riding his Suzuki GSX-R1000 motorcycle with a passenger at his back. He’s not sure what happened exactly, only that he was driving around a bend when he crashed. There may have been another car involved, he can’t say with certainty, but when he woke up he had no idea how long he’d been out. He couldn’t move his extremities. He screamed at his friend to remove his helmet, and he laid there in a sunken panic, waiting for help to arrive. If that sounds like a nightmare, it’s a nightmare he’s had on repeat for the past eight months. Straus, a two-time mixed martial arts champion in Bellator, hadn’t been drinking that night. Nor doing anything that would impair his ability to operate his motorcycle. He had been hanging out with a friend and was en route home, and the next thing he knew he was being transported to a hospital, his livelihood shattered, dealing with the real possibility that he may never walk again. To replay the events of that night is to try and put together the pieces. And that’s what Straus has been left with — pieces. Little flashes of memory that take him a thousand directions whenever he looks back. Eight months later, Straus is in Las Vegas. After relearning to walk again, at first with help, and then on his own, he is back training. He has become a fight game nomad, trying to find himself a home, and has ended up — for the time being, anyway — at Xtreme Couture. He is relearning to wrestle, and to spar, to clinch and scramble — to do all the things he once did, but to do them better. He is trying to put together a second run as a fighter using the same mental resiliency he used in becoming a two-time champion. It hasn’t been easy. There have been neck braces and sleepless nights, thoughts of “why me?” There have been doctors doubting he’ll ever fight again, and slow — but determined — cooperation from his body to prove them wrong. But there have been small miracles, too, such as seeing his fingers bend to his will, and watching his feet shuffle under his own weight, toward wherever he is directing them to go. Things that able-bodied people take for granted. Straus is a proven battler, going back to his childhood in Cincinnati. That part of his story is par for the fight game — the overcoming of tough conditions in a fatherless household…the lack of nurturing and money…the life of petty crime…the fending for himself after moving out as a junior in high school…listlessness that turns into crime that turns into time — but Straus always felt destined for bigger things. He realized that in a strange place — while serving three years on robbery charges in Florida. It was jail that first taught him about helplessness. It was also jail that strengthened his resolve to never be helpless again. The one thing he carried with him through the sentence was wrestling glory from his days at Sycamore High. He realized his story would improve if he applied it to MMA, which he began doing upon his release. How did he vindicate himself? By winning fights. Lots of them. Between 2009 and 2011, Straus won a dozen fights in a row, including his debut in Bellator against Chad Hinton. By 2013, Straus had catapulted himself to the level of featherweight champion. He beat Pat Curran at Bellator 106 to capture the title. When he lost it four months later to Curran in a rematch, he brushed himself off and started over again. By 2015, he recaptured the featherweight title by beating the man who has become his archnemesis over the last few years, Patricio Freire. It was all that scaffolding — the experience of losing and winning, winning and losing — that kicked back into his resolve last December on US-441, when the internal drive to overcome a bad break began to work its magic again. The injuries he sustained were not minor: Bulging discs, spinal contusions, and spinal stenosis — a condition where the spaces within your spine are compacted. To hear him talk about it now, he says his body — which he has drug from wrestling mats to rings to cages since youth — was already susceptible to the injuries and that the crash “flared them up.” On that front, he says, though it was scary beyond what he’s able to convey, he’s “not as damaged as people think.” Yet because of it he also counts his lucky stars that it wasn’t worse, colliding with a guardrail at such a high rate of speed. Just as lucky, his passenger that night came out of the crash relatively unscathed. He believes his own body broke her fall. And Straus says one of the silver linings is that he’s found himself in tune with that body. He marvels at its most basic functions in ways that ordinary people might not. Humbling, but not defeating. Though he was regaining movement in his toes and hands within a week, he was told initially that he may never fight again. As he continued to improve, he was told he wouldn’t fight for at least a year. While all that was being told to him during that dark time he told himself that he would be back in six months. He was tinkering with his new sentence — this time a sentence spent out of a cage, trying to get back in — by the time he left the hospital, setting his own game plan like he would a fight. By early summer he was not only back in the gym, but he was already eyeing his return. He wants to fight in Bellator again — which he says has stuck with him the whole way — in the late fall or early winter. His goal is to fight by December if possible, before a full year has passed. Why? Because he said he would, and he believed it. He doesn’t have an opponent in mind. He just has a mission to get back in there, to do what he loves again — to fight, and to overcome any lingering fear. He looks at all of this as a fresh beginning. A new chance for him to overcome the scariest curve life has ever thrown him, and a chance for a new coach to mold him in the right way. In fact, when he told Joe Rogan that he was a “broken toy desperate to be fixed,” he meant that he was open to a coach putting him back together the right way. Fixing the flaws that were there before through his process of rebuilding, technically and physically. A world champion again? At 34 years old? After a serious accident in which he had to relearn to use a fork? After losing to Emmanuel Sanchez last October, to push him a little further back in the field? At a time when he’s searching for a new gym environment, after parting ways with American Top Team? “That’s my goal,” he says, with no concern at how lofty that might sound under the circumstances. “To get back to a world title position, and fight for my belt again.” And here he gets quiet for just a second, as he contemplates the original trouble before the accident ever occurred. The belt that he lost. Twice. The belt that he was already envisioning getting back. The belt that, as it fell further in his rear-view mirror, came into sharper focus than ever. That’s part of the reason he says he’s in Vegas. The other part? “I felt like I needed a change,” he says. “The whole story line makes my case unique. I won this belt, I’m in this huge rematch, I break my hand, I sit out a year-and-a-half. In that time I had a buddy who was murdered — a buddy who was at my last fight, where I won. I lose to Patricio [Freire]. Lost my next fight to Emmanuel, which really devastated me. Then my longtime girlfriend broke off our engagement. Then this [accident] happens in December, and I lose my place because of it. 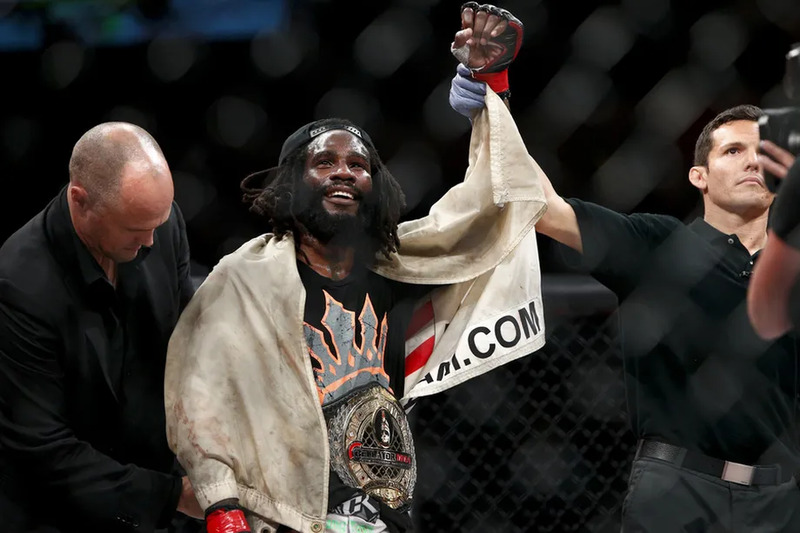 Not many fighters have gone through the kinds of challenges Daniel Straus has, yet he owns that such challenges are nothing more than detours on the path he chose. Getting busted in Fort Lauderdale back in 2013 for possession of marijuana? Another example that he’s not perfect, nor that he ever intends to be an angel. Yet the dots all connect back to his immense resolve. His setbacks have been the products of risk. The risks have been products of a fighter’s mindset. His mindset is resilient. Focused. Stubborn. That’s why, back in early July, he found himself back on his motorcycle, pushing 170 miles per hour. The reason: If he can get back on again, he can do anything. He laughs, playing with the idea that overcoming his own fears is far less complicated than overcoming other people’s fears for him. What is he doing? Trying to prove — to himself and to everyone — that there’s little question about that kind of backbone. That’s when Straus knew he was back.